Dogs are perhaps best known for their unwavering love and loyalty. This is probably why the saying “dogs are man’s best friend” is heard over and over again. Needless to say, it is a title well deserved. There is a long history of dogs staying fiercely loyal to their human companions. Perhaps one of the most popular stories is that of Hachiko the dog. Hachiko was an Akita Inu from Japan. He might not be as popular overseas, but the Japanese regard him as a national hero. The dog has a statue made in his honor at the Shibuya Train Station in Tokyo. He’s also become the subject of countless films, including a Hollywood remake starring Richard Gere. So why is Hachiko the dog given such a huge honor? Well, you’re about to find out. Keep reading to learn more about Hachiko and his bittersweet tale of love and loyalty. Hachiko the dog was an Akita Inu, a breed of dogs that originated from the Akita prefecture in the mountainous northern regions of Japan. History has it that the Akita is one of the oldest of the native dogs in the world. They have features that are similar to other ancient breeds like the Siberian husky and chow chow, with small, erect ears, soft coats, and curved tails. The breed were the choice companions of the Matagi, a group of traditional winter hunters that were largely responsible for saving the Akita from extinction. The Akita has faced danger of dying out more than once. In a desire to breed the perfect fighting dog during the Meiji era, the Akita were crossbred with Tosa fighting dogs and other dominant dogs from the west. It was not until 1917 that the mayor of Odate finally put an end to this vile business by establishing the Akita Dog Preservation Society. After the dog fighting industry died down, the Akita was once again in danger of going extinct. What’s even more heartbreaking is that during the Second World War, all dogs except the German shepherd were slaughtered for their meat and fur. After the war, efforts to preserve the Akita and other dying breeds were more than ever. Two Akita dogs, Kamikaze-go and Kenzan-go, were brought to the United States by American author and activist Helen Keller. Hachiko’s story took place years before World War II broke out. He was born in 1923 in Akita prefecture and was later adopted by Prof. Hidesaburo Ueno, an associate professor of agriculture at the University of Tokyo. Ueno had long been wanting a purebred Akita, so when his student told him about an Akita from Odate City, he didn’t think twice about adopting him. The pair resided in Shibuya, a district in Tokyo. As Hachiko grew up, he would follow his master to the train station each morning to send him to work. Later in the evening, he’d return to the station to greet Professor Ueno at the exact time his train would arrive. This has become the routine of Hachiko the dog for 1 year and 4 months, until one day, Ueno didn’t come home. It turns out the professor had suddenly died from a cerebral hemorrhage while at work. After his dear owner’s death, Hachiko moved in with Kuzaboro Kobayashi, a former gardener of the Ueno family. Though Kobayashi took perfect care of Hachiko, the dog never forgot Professor Ueno and would still head to Shibuya station to wait for him. Hachiko became a frequent visitor at the station, much to the amazement of the commuters who used to see him and Professor Ueno together. 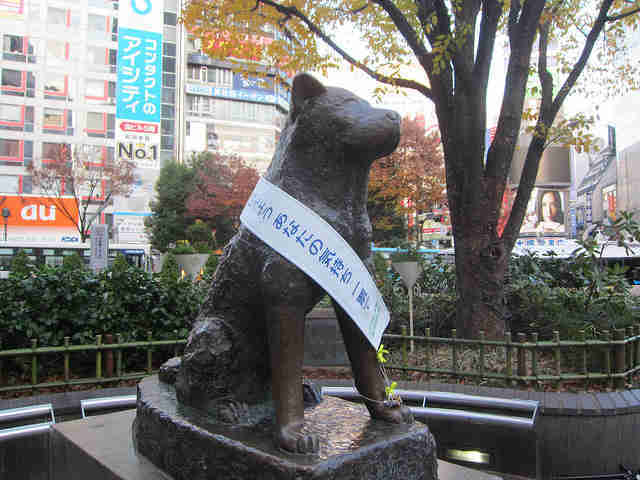 One of Ueno’s former students, Hirokichi Saito, published the story of Hachiko after spotting him at Shibuya station. He then followed the dog to Kobayashi’s home, who in turn told him about Hachiko’s story. Shortly after their meeting, Saito published the documented population of Akitas left in Japan. Together with Hachiko, there were only 30 purebred Akitas remaining. Saito’s articles eventually reached a major newspaper publication in Japan, which instantly made Hachiko famous. In 1934, the government ordered that a bronze statue of Hachiko the dog be constructed at the Shibuya station. The statue has become a landmark in Japan with tourists from all over the country and abroad flocking to see the last remaining memory of this loyal dog. In 1935, Hachiko’s lifeless body was found in a street in Shibuya. He died at the age of 11 from terminal cancer. Up to his very last breath, Hachiko had continued his vigil for his beloved owner. Hachiko’s body was cremated and his ashes were finally laid to rest in Aoyama Cemetery in Minato, Tokyo. To this day, he rests on the spot beside his beloved master, Professor Ueno. Hachiko’s fur was preserved after his death and later stuffed and mounted on a permanent display at the National Science Museum of Japan. A similar statue stands in Hachiko’s hometown, right in front of Odate Station. In 2015, during the twentieth anniversary of Hachiko’s death, yet another statue was constructed in the dog’s honor. This time, it showed Hachiko finally reuniting with his owner. The statue was made by the Faculty of Agriculture of the University of Tokyo, the same school and department where Professor Ueno once taught. It is a beautiful tribute that shows that despite not reuniting in life, the years they shared and the love they had for each other remain etched on everyone’s mind and will live forever. Or learn more about our 3G GPS dog tracking devices. With trackidog you can view the location of anyone, anywhere, anytime. trackidog unique system was designed to be highly informative and user friendly. It allows tracking the real time location of your devices, or check the history log of the device with an easily customizable time range. Copyright © 2018 • Trackidog All rights reserved.